Located just minutes away from the city and London's famous Southbank, you will be within walking distance of Waterloo Station and some of the capital's most famous landmarks, including the London Eye, Tate Modern and St Paul's Cathedral. The hotel has 182 modern guest bedrooms, fully-equipped meeting rooms, free Wi-Fi, a heated indoor swimming pool, a saunarium, and hotel restaurant Jamboree Foodfest and Bar. 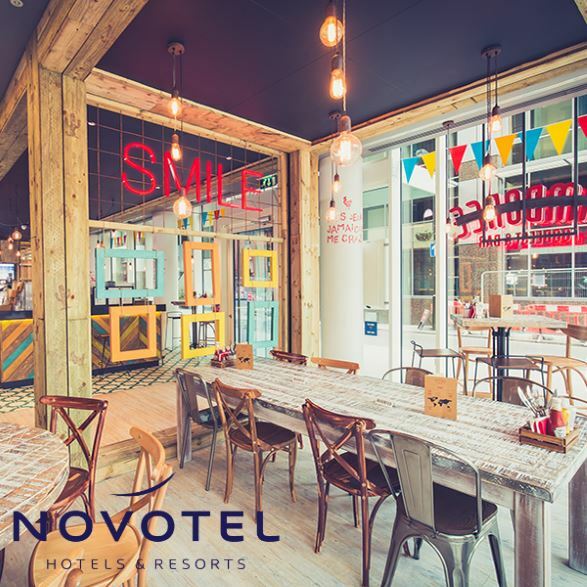 A beautifully designed, contemporary, and exciting hotel in a vibrant area of London - Novotel London Blackfriars is perfect whether you're staying for business or pleasure. As the nursery rhymes goes: twinkle twinkle little star, point me to the nearest bar. Make sure that bar is Jamboree Foodfest and Bar - a place where you can kick back, have a wicked time, and treat yourself with something different. The foodfest and bar concept is based on flavours from around the world. Whether you're looking for a spot to enjoy a social gathering, watch sporting events (we have two gigantic screen projectors), listen to live music, or even romance your first date - we have it all! So, come and join the laid back team with big heart, embrace the great ambiance, and share some of your corny jokes too - we love hearing them.